It is said that the time between 4 and 12 years old is an important period for mental development and learning, and the experiences during this period could greatly influence a child’s life. During this period, various types of personality characteristics - such as shyness, athleticism, or confidence - are molded. This formation of character depends on the lifestyle in infancy. Playgrounds where children could play and run freely have slowly been disappearing from our cities. 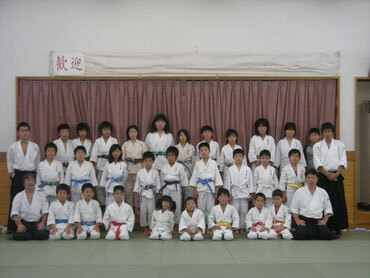 Recently, the existences of a dojo (training room) and sport classes have been utilized more and more. The Japanese martial arts are characterized by a blend of both dynamic motion and static motion. A good example is the practice of “seiza” (sitting on one’s knees) done at the beginning and end of classes. This is different from the Western sports that need continuous tension throughout practice. In addition, since there are no matches in Aikido, children can enjoy its training without straining at victory or defeat. On the other hand, compared with other martial arts which have matches, it is more difficult to coach children keeping their attention. Under this kind of situation, we make efforts so children can realize the fun and enjoyment of Aikido as much as possible. I also consider ways to enhance children’s mutual friendship, exchange, and the observance of rules in group life. I not only do this through the training in the dojo, but also through training in camps and tournaments. Various types of children can join in my dojo, and I aim to assist those that may be physically weak, shy, naughty, overweight, or bullied. At present, I coach children from 4 to 12 years old who differ from each other in understanding, strength, and motor skills. I try to coach them so that at the end of practice all can feel “though I am tired, it was fun”! 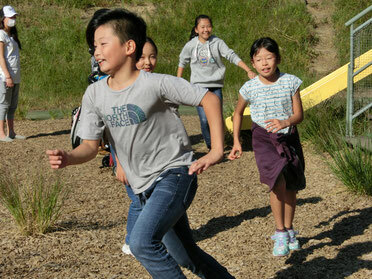 I also coach children to develop a sense of consideration for others by having older children take care of the smaller children, and the athletic children help the non-athletic children. Before the age of 13, it is important to develop the basic strength which makes it possible to adjust to every life situation. It is also appropriate to start learning real techniques of Aikido after the age of 13, when their body has grown a good frame. The instructional policy and environment of the dojo are very important, but the passion and love of parents is essential for children. We hope to see parents with a great interest in supporting their children with a “stay at it” attitude.